Indeed, Apple has upgraded the processor of the newly released iPhone to A7, it is said to be the first 64bit processor to be used in mobile device, it will take full advantage of the radically changed iOS 7. According to Apple it will be up to 40x faster in CPU performance as well as up to 56x faster in GPU in comparison with the Original iPhone that was released in late 2007. On top of that it has M7 motion coprocessor that will take the accelerometer and gyroscope duties to the new level and create a lot of opportunities for developers. It still works on LTE networks and has no problem at all with running on 4G in every country that supports it. Apple is not trying to increase the number of pixels. Their strategy is quite different. They stayed with same 8 mega pixels but increased their size – as a result better low-light footage. Besides that the new flagman has a dual flash and true-tone technology, that makes pictures taken with this device look more real and better performance in low-light conditions. Camera also features auto image stabilization and burst mode. In terms of video camera improvements – they have implemented the 120 Slow-mo mode, that allows to shoot HD video (720p) with the frame rate of 120/sec, in comparison with regular 30 fps. 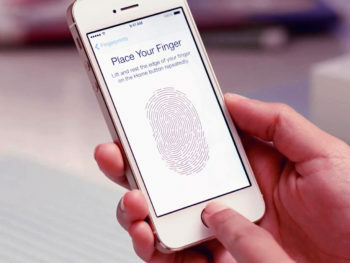 The most interesting announcement connected with new iPhone 5s was the Touch ID technology. It is primarily for unlocking the device and eliminating the inconvenience with re-typing the password over and over again in iTunes/Appstore/Apps and other related services. Touch ID has the sensor that is 170 microns thick, and scans the fingerprint at 500dpi. By scanning the sub-epidermal skin layer – it eliminates any ink or surface scratches. Also, the sensor scans fingerprints at any angle. Finally, new flagman devices from the fruit company iPhone 5C and 5S will most likely find their audience. More than 7,000,000 iPhone 5S have been sold already and more than 3,000,000 of 5C.